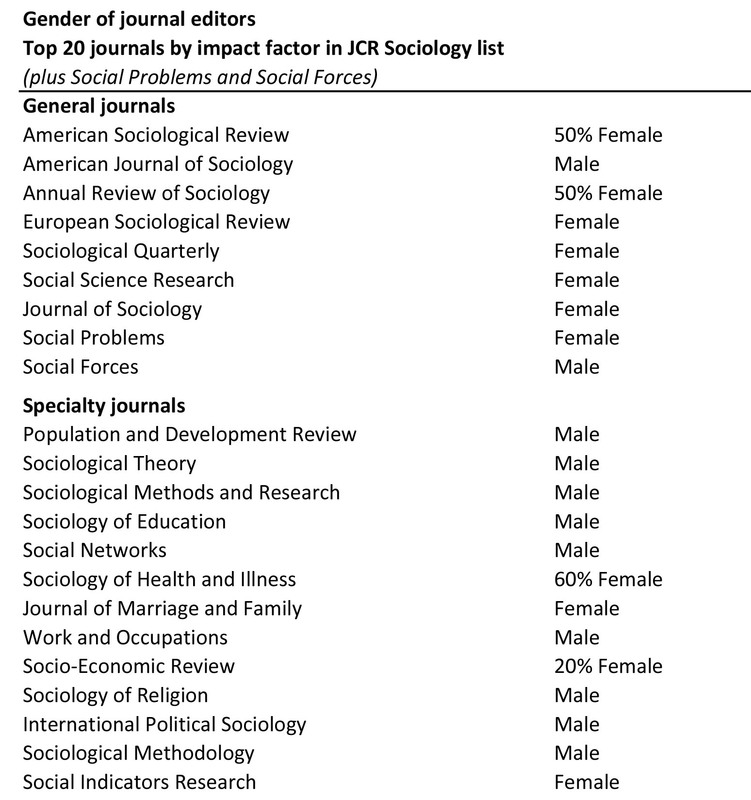 Four years ago I wrote about the gender composition of sociology and the internal segregation of the discipline. Not much has changed, at least on the old measures. Here’s an update including some new measures (with some passages copied from the old post). People may (or may not) want to be sociologists, they may or may not be accepted to graduate schools, thrive there (with good mentoring or bad), freely choose specializations, complete PhDs, publish, get jobs, rise to positions of leadership, and so on. 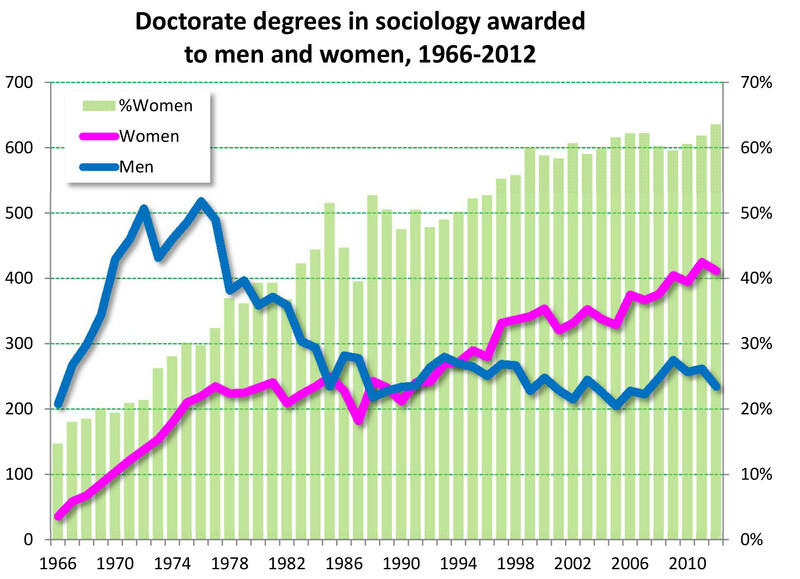 As in workplaces, gender segregation in academic sociology represents the cumulative intentions and actions of people in different institutional settings and social locations. It’s also the outcome of gender politics and power struggles. So, very interesting! A report from the research folks at the American Sociological Association (ASA) got me thinking about this in 2011. 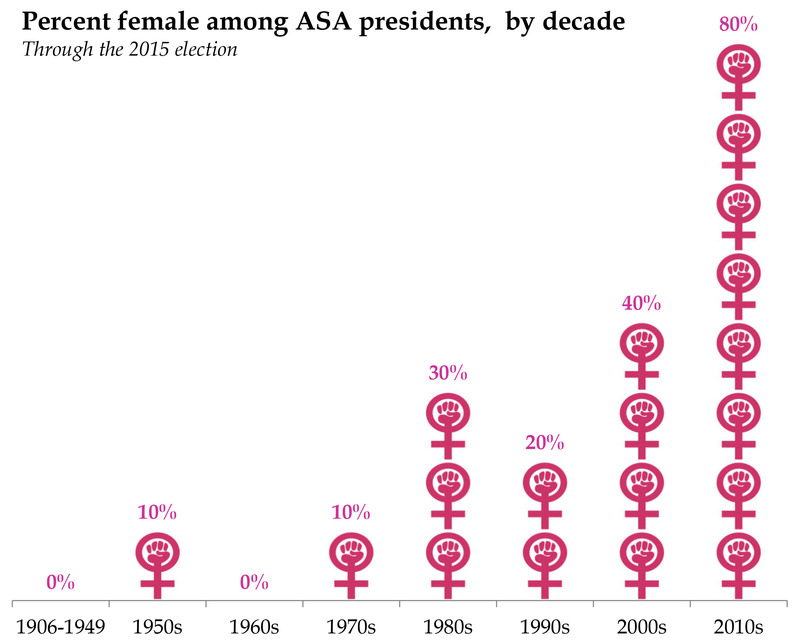 The conversation revived the other day when someone asked ASA Vice President Elect Barbara Risman (a friend and colleague of mine), “What do you make of the fact that increasingly the majority of ASA election candidates tend to be women?” As we’ll see, the premise may be wrong, but the gender dynamics of ASA are interesting anyway. 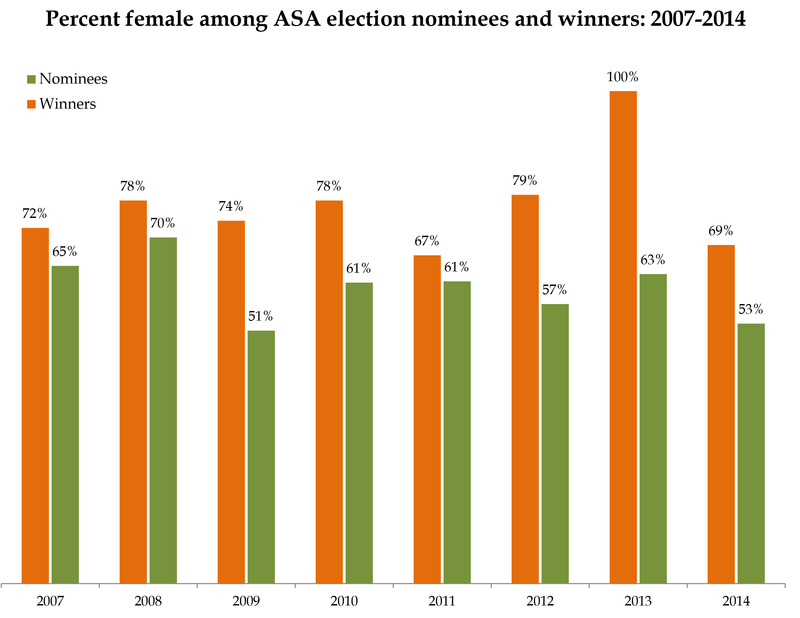 The nominating committees pick (or convince) more women than men to run, and then the electorate favors the women candidates, for reasons we can’t tell from these data. These elections are run in an association that became majority female in its membership only in 2005, reaching only 53% female in 2010. That trend is likely to continue as older members retire and the PhD pool continues to shift toward women. Producing mostly-female PhDs for a quarter of a century is getting to be long enough to start achieving a critical mass of women at the top of the discipline. These numbers haven’t been updated by ASA since 2010. The pattern of section belonging at that time showed a marked level of gender segregation. On a scale of 1 to 100, I calculate the sections are segregated at a level of .25. Finally, prestigious academic journals have one or more editors, often some associate editors, and then an editorial board. In sociology, this is mostly the people who are called upon to review articles more often. Because journal publication is a key hurdle for jobs and promotions, these sociologists serve as gatekeepers for the discipline. In return they get some prestige, the occasional reception, and they might be on the way to being an editor themselves someday. 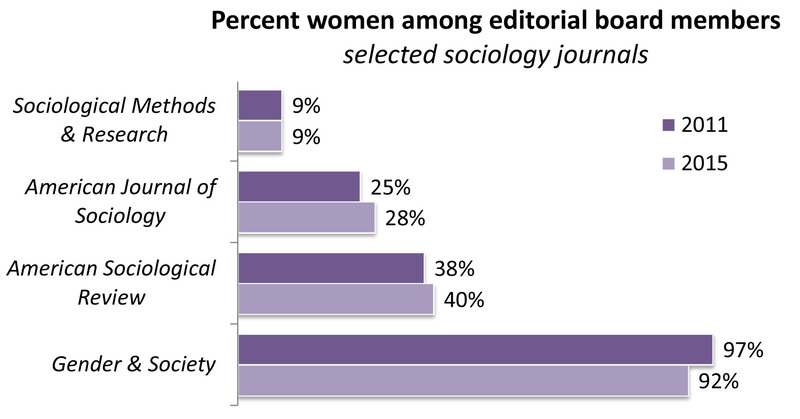 It looks like the gender gap is partly attributable to the difference between journals run by associations and those run as department fiefdoms or by for-profit publishers. I removed a couple board members I know to have died in the last year, so these lists might not be that up to date. Note on the journals that SMR and AJS are fiefdoms with no accountability to anyone outside their cliques, so it’s not surprising they are decades behind. ASR and G&S, on the other hand, are run by associations with majority-female memberships and hierarchies, in the case of G&S with a feminist mission. (ASA demands reports on gender and race/ethnicity composition from its editors.) AJS has no excuse and should suffer opprobrium for this. SMR might argue they can’t recruit women for this job (but someone should ask them to at least make this case). 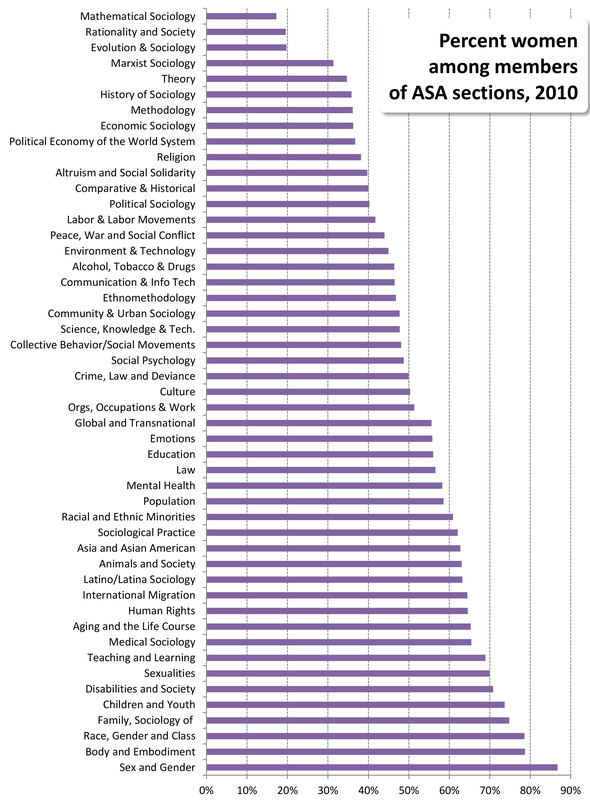 Gender stratification of Majors by IQ? The only negative outcomes of this are low pay potential, and extreme liberalization of the field as a whole.